Apologies for the blog hiatus. Coupled with everything settling back down to normal post-wedding, I've been suffering a slight lack of inspiration. Or, okay, a big lack of inspiration. It got so bad that I think I spent most of last month living off takeaways, which is bad both for my wallet and my waistline. However, when not suffering from a complete lack of inspiration I did manage to make a few things which will be appearing on the blog over the next couple of weeks. This is a lovely, summery salad and a more interesting take on the more conventional tricolore salad. 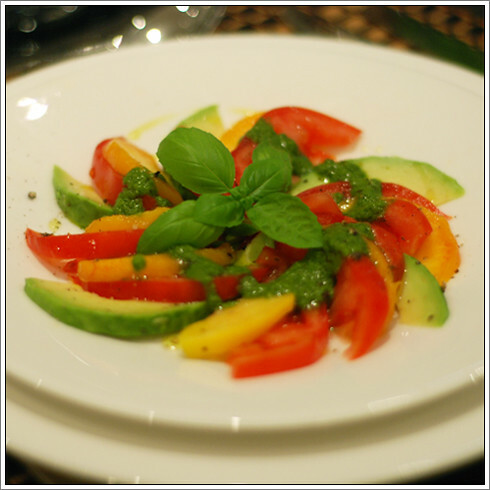 The peaches and the basil dressing work so well together, and it is already long since established that tomato and avocado paired together is really rather lovely. It can be difficult to get decent-tasting tomatoes in the UK, so I never put mine in the fridge. It doesn't quite give them that sun-ripened flavour burst, but it's the next best thing. To peel peaches, run the blunt edge of a knife across the skin a couple of times - it means you lose less peach than slicing it off with a knife. To make the dressing, tear up the basil and crush the garlic into a blender, then blitz with the olive oil, garlic, lemon and seasoning until all the ingredients are combined. Taste before removing from the blender - sometimes I find I need to add a little more oil or lemon to get the balance of flavours how I like them. Peel the peaches and avocado, then slice thinly and arrange on a plate. Drizzle a couple of teaspoons of the basil dressing over each serving, then garnish with a sprig of basil. And voila - a delicious summer salad which is ready in minutes! Perfect as a starter when you want to spend more time talking to your guests than slaving in the kitchen.